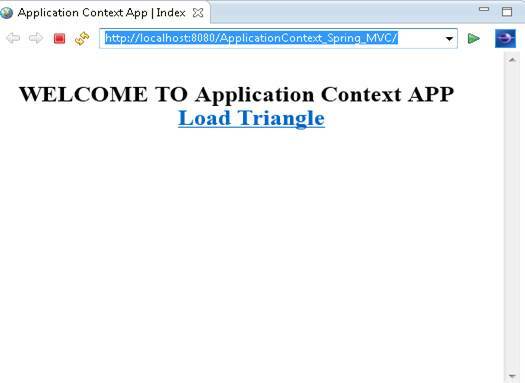 In this tutorial, we will learn what is ApplicationContext and the process to create web application with ApplicationContext using Spring MVC 3.2. ApplicationContext is an interface implemented to create bean objects for all the defined beans into spring configuration file. This file should be assigned into the classpath of the project. This interface creates an application context object for a class that required to be created for once for a specific configuration file. This context object will help us to create bean object for the bean classes. To create a bean object for the spring bean container, an interface (ApplicationContext) is widely used that is defined in “org.springframework.context”. 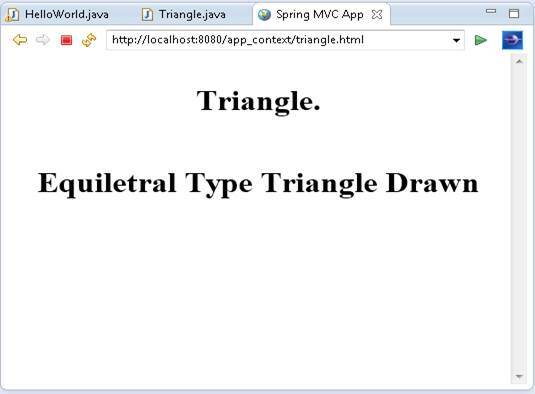 In this article, we will create a web application using Spring MVC and ApplicationContext interface will be used to bean object of bean class “Triangle” to access draw() method. This method returns a string that will be printed into the loaded JSP page. We are going to create this web application using Eclipse IDE. Go to file->new->other that will open a wizard “Select a wizard” and write “Dynamic Web Project” and hit “Finish”. This opens “Dynamic Web Project” wizard, place a project name, target run time environment. Press next and next, choose “Generate web.xml deployment descriptor and hit “Finish”. The above figure shows the directory structure for “Dynamic Web Project” created using “Eclipse” IDE. We are required to add a set of spring jar files with this project. To add these jar files into this project, right click on project and choose “Build Path->Configure Build Path” click on “Libraries” tab and choose or create a user library or add jar files directly using “Add External JARs”. 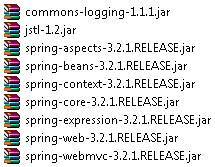 These are the required list of jar files. All the request comes to deployed web application will hit the deployment descriptor xml file web.xml. The above code loads web.xml file, a deployment descriptor file. All requests hit this file and are transferred to “DispatcherServlet” class of “org.springframework.web.servlet” package. It loads the default file “index.jsp” defined in <weblcome-file-list> and its sub-tag <weblcome-file>, once the application has been deployed. The above code creates an interface for application welcome file that has a hyper link to load the controller method using “triangle.html” file name. 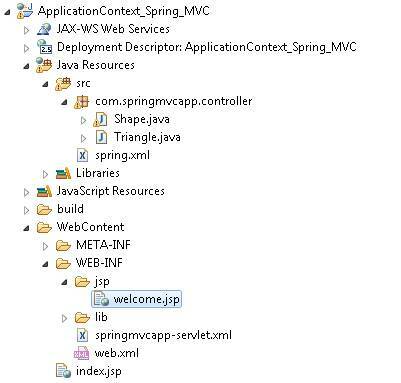 The springmvcapp-servlet.xml file defines a directory for controller and view portion of the application. The base-package name “com.springmvcapp.controller” is loaded with its sub-packages and java class files to be managed as controller and models. The directory name “WEB-INF/jsp” contains all the view for the application. This annotation is method specific and defined before the method definition. This class defines a method triangle() that return data object to ModelAndView class type that loads the “welcome” jsp file with the message variable name “message1” using the string variable “message” defined in class. In this method, An instance of ApplicationContext interface is created. A ClassPathXmlApplicationContext() constructor is assigned to this instance that initialized all the defined beans in “spring.xml” file. The <bean> tag defines a bean for bean class “Triangle” defined in “com.springmvcapp.controller” package. The <property> tag is used to assign the “type” member variable of bean class “Triangle” using “name” and “value” attributes. The above code defines a bean class “Triangle”. It defines a draw() method that will be called by “Shape” controller, once an ApplicationContext instance has been created. Where message1 is the variable passed by the controller. Now to deploy the application on the server, right click on the application directory structure and choose “Run As->Run on Server” that opens “Run on Server” wizard and choose the server configured with the Eclipse IDE. Press next or finish button to deploy the web application on the server immediately. Once the application has been deployed on the server, a new browser tab will be opened with its startup page. 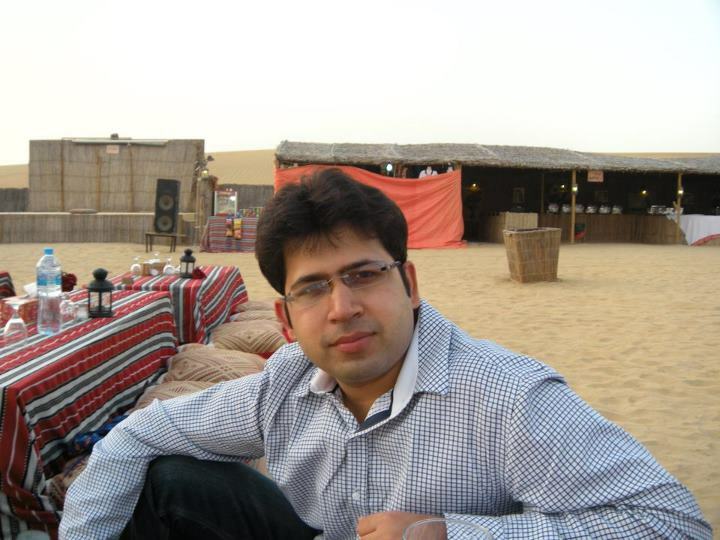 The url http://localhost:8080/ApplicationContext_Spring_MVC/ will open the deployed application into the web browser. How do we create web application using Spring MVC 3.2?